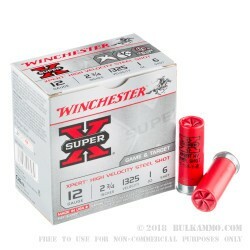 Another very versatile round for Winchester, this 12 gauge #6 shot in the Super X “Xpert” Shotshell line offer waterfowl dedication in the design and gives you another good option at the sporting ranges. The steel shot features a high velocity loadout that compensates for the minimal differences between steel shot and lead without costing you an arm and a leg. A great choice for sporting uses on lead restricted ranges or for field use in wetlands after waterfowl or birds that cannot be shot with lead. 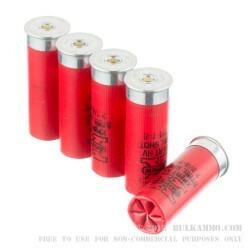 The #6 shot offers distinct advantages over the lighter #7.5 or #8 that you would normally shoot with a lead payload. This alone nearly compensates for the spread deviation and the wind deflection concerns when shooting steel over lead. Furthermore, the higher velocity powder used, pushes the slightly lighter steel payload out further and faster, making contact on targets that steel might struggle on at further distances. 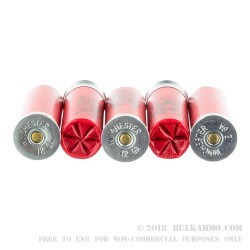 This is especially important for the above use cases (restricted ranges or hunting areas), because it puts the steel on target in the same manner that the lead in a slightly smaller shot size would have been. 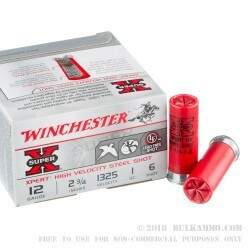 You are successful on more shots with the steel shot than ordinary, with less difficulty getting there.